Congratulations to Our 2018 Sustainer Inspiration Award Winner, Marcia Holcomb! 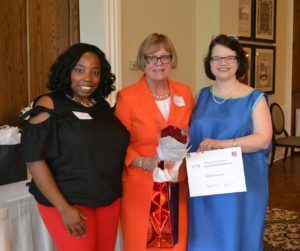 The Junior League of Akron Sustainer Inspiration Award is presented to a woman who embodies The Junior League of Akron’s mission of empowering women for positive change in the community. It is given to a sustaining member whose League and community service have inspired other League members, and whose League experience served as a springboard for greater positive impact on the Akron community. The recipient of the Sustainer Inspiration Award is Marcia Holcomb of Akron. Holcomb joined the Junior League of Akron in 1982 and was an active member until 1989. Her early years within the Junior League began with service on the LoudSpeaker, Cookbook, and Nominating and Placement Committees. Perhaps a precursor to her future professional and volunteer life, Holcomb also immersed herself in the financial and logistical planning for two of the League’s largest ShowHouse fundraisers: the Galt Mansion in 1984 and the Byron Robinson Mansion in 1988. Between those ShowHouse events, Holcomb chaired both the Nominating and Placement and Education Committees; additionally, she served on the Galleria fundraiser as well as Junior Leadership Akron steering committees. In addition to her service to the League, Holcomb has also been involved in many other local organizations. She devoted her time to Mobile Meals, Akron Children’s Hospital’s Women’s Board and the TWIG program, American Cancer Society and the March of Dimes. She also served on the board of the Christ Child Society of Akron and is currently on the board of the Akron Rotary Endowment. Her passion and dedication to this community is one to be admired.